Vampires and Werewolves and Fairies, OH MY! If you love all things supe and just can’t get your hands on enough lit to keep you occupied & addicted, you’re in the right place. If you DON’T love Twilight and Sookie Stackhouse and The Black Dagger Brotherhood, and all that jazz… well, maybe you just haven’t found the right book or author… and I am happy to dish til you discover your own personal brand of paranormal-heroine. I came late to the Twilight scene. I was one of those people who was too “adult” to bother watching it in the theater, so sure I would just absolutely hate it. Then a year later, there I was, addicted to the books and soaking up every snippet of text, video, and rumor I could snag. Twilight-addiction led into Sookie-Stackhouse-addiction, which led into a whole new world of paranormal-romance-addiction. That’s when I discovered I’d been missing out on an entire genre of literature! Neglected! Lonely! Abandoned in my relentless pursuit of all things fantasy and sci-fi and gamer-girl-geek! I also found that while it was awesome that I now had fuel for my overpowered and bloodthirsty new addiction, I also had NO idea where to start. Apparently, unbeknownst to the me who’d studiously ignored the rise of vampire fiction in pop culture, paranormal romance had become such a hot item in the publishing world that there were more authors and series and storylines and blah blah blah than you can shake a stick at. (Although, honestly, I’m not sure what kind of measure that is. I can shake a stick at a lot of things if you line them up in front of me…) I’m fairly picky about what styles of writing I read, and I have a hard time getting through books that don’t grip me from the start (oh, The Host, how I had higher hopes for you!). So where to start? 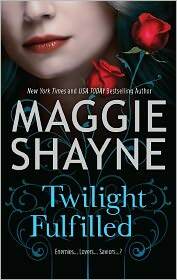 Where to go from Stephanie Meyer’s Twilight series? From Charlaine Harris’ Southern Vampire series? Here you will find my take on the paranormal romance series that I have read. There will be reviews and recommendations, but most importantly, there will be a clear comparison of writing style, age-appropriate content, and all the other little things that come together to differentiate each author and series from the others. If you like Sookie Stackhouse and want to know what to read next, I will happily lead you to your gateway drug… I mean next read-of-choice. If you hated Sookie Stackhouse, I’ll help steer you to somewhere you can take out that southern angst on some other poor undead. A friend of mine told me I should do an algorithm to link all these books, and being the geeky math & science girl I am, I thought EUREKA! That’s exactly what we need!! SO! How about: ”Follow Me” and I’ll guide you on your tour of the best of paranormal romance! Pssst: Click the Subscribe to RSS button at the bottom to see this blog in your Google Reader, or click the Email link to receive updates by email!